Custom Tablecloth Size, Color and Composition. Custom Tablecloth - 100% polyester, machine washable, iron well and feel like cotton. Typical sizes for a custom tablecloth are six and eight foot in length. Of course your custom tablecloth made to any size. Your Custom Tablecloth may have it's own PMS (Pantone Matching System) color, or a standard color as seen on our Tablecloth Color Chart. Emergency same day shipping available. Over 50 fabric colors to choose from. Size consists of six and eight foot or may be custom cut. Call Mike for personalized help with your Tablecloth. Six Foot Black Custom Tablecloth with Logo. Custom Tablecloth fabric color is dictated by the fabric mills. PMS (Pantone Matching System) colors are available upon request. 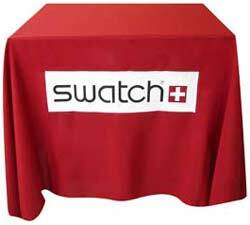 Display Hint: Keeping your Custom Tablecloth graphics simple will attract your prospects eye easily. Use contrasting colors for your Custom Tablecloth that reflect your corporate branding or have a neutral balance. Send me your logo and I'll do a free mock up for you! Your Custom Tablecloth is made from durable 100% woven polyester. The same quality you find at a banquet hall. See Tablecloth Care. Experience has taught us woven polyester is durable, feels like cotton, cleans easily and is wrinkle resistant. This four foot Custom Tablecloth was sent to New York, New York. See additional Custom Tablecloth and Logos. Four Foot Custom Tablecloth with Logo. Right, is a twenty four inch round Custom Tablecloth. A tablecloth is also referred to as a "Table Throw" or "Table Cover" in that it is not fitted. A fitted tablecloth is cut and sewn so it fits snuggly at the corners. The down side is fitted tablecloths can not be interchanged with other size tables. Unless otherwise requested, we will ship a Custom Tablecloth cut to an unfitted eight foot size. 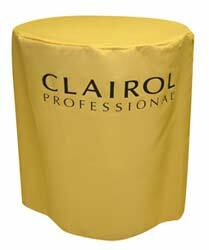 See other Custom Tablecloths with Logos. Twenty Four Inch round Custom Tablecloth. For additional help, please feel free to give me a call and we'll discuss your Custom Tablecloth.